With nearly a year to travel around you might wonder why we are acting all rushed and taking weird border crossings. 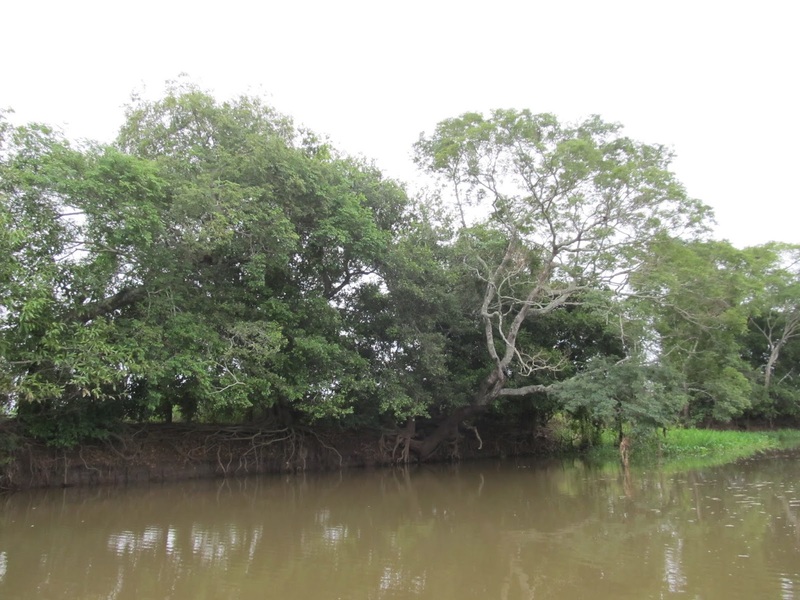 The reason was the Pantanal, the world’s largest wetland, located in the tri-border area of Brazil, Bolivia and Paraguay. 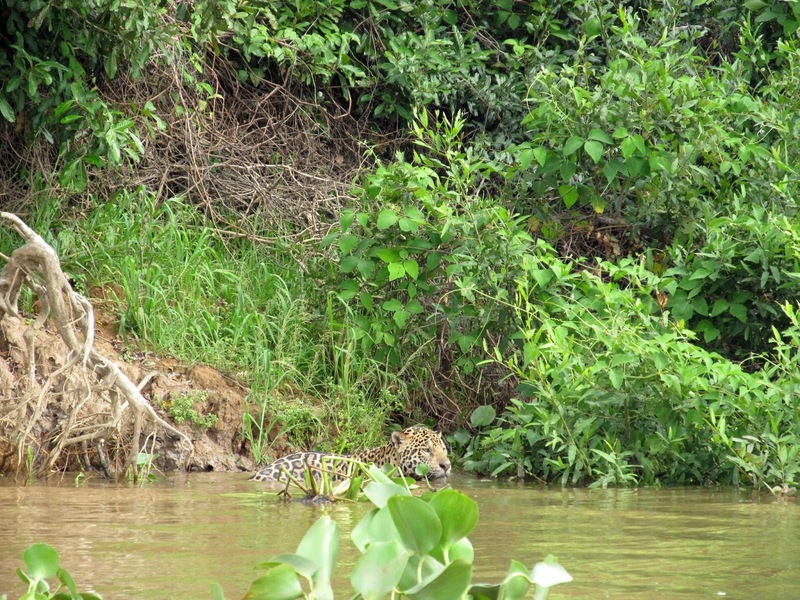 The Pantanal is generally considered to be the best wildlife “safari” destination in South America and one of the only reliable places to see a jaguar in the wild. The dry season is from June to October and we were worried about the coming rains reducing our accessibility into the area and likelihood of seeing anything great. 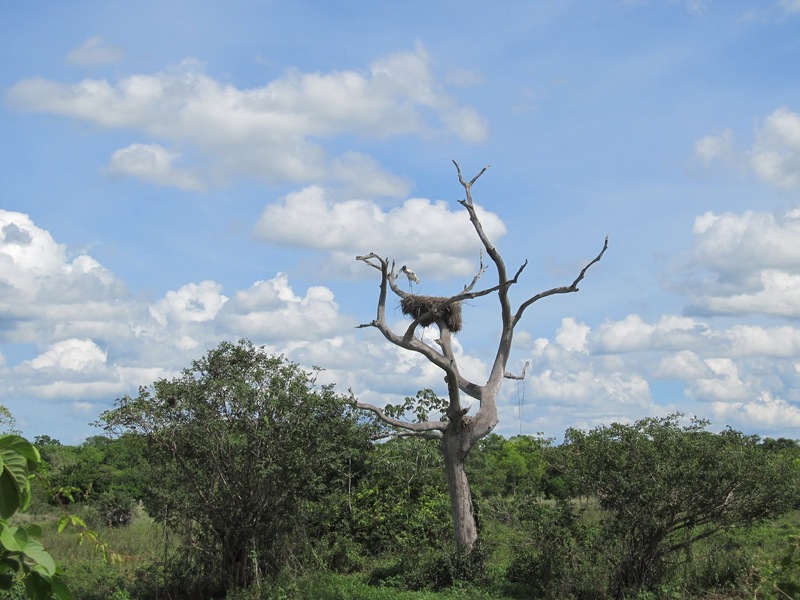 Brazil is the only country really set up for any tours into the Pantanal and while they run from both the north and south, the north is generally considered to be of better quality. 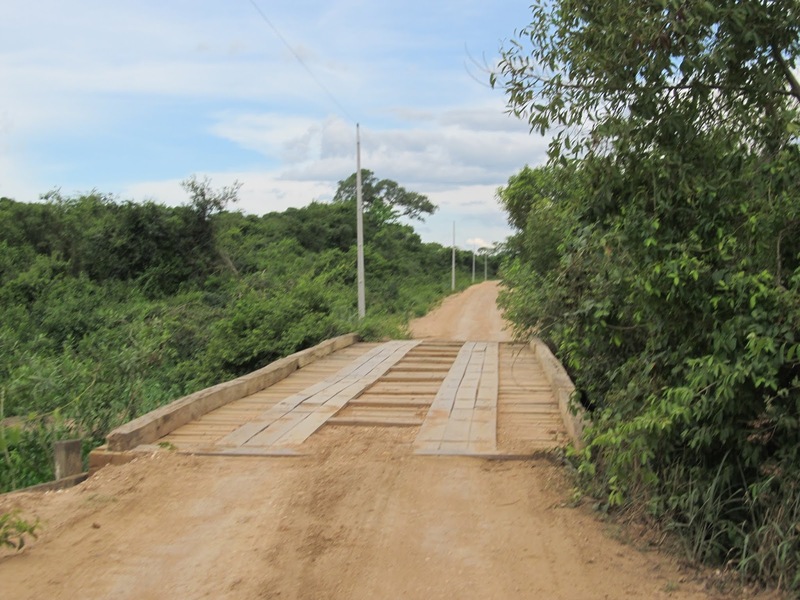 So it was the San Matias border crossing for us to get to Cuiaba where we would start a 4 day/3 night trip into the northern Pantanal with Ecoverde Tours. People will pay, but not that many, which is part of the attraction; there aren’t huge crowds ruining the atmosphere and scaring off the animals. Most of the foreign visitors are in the Amazon instead. 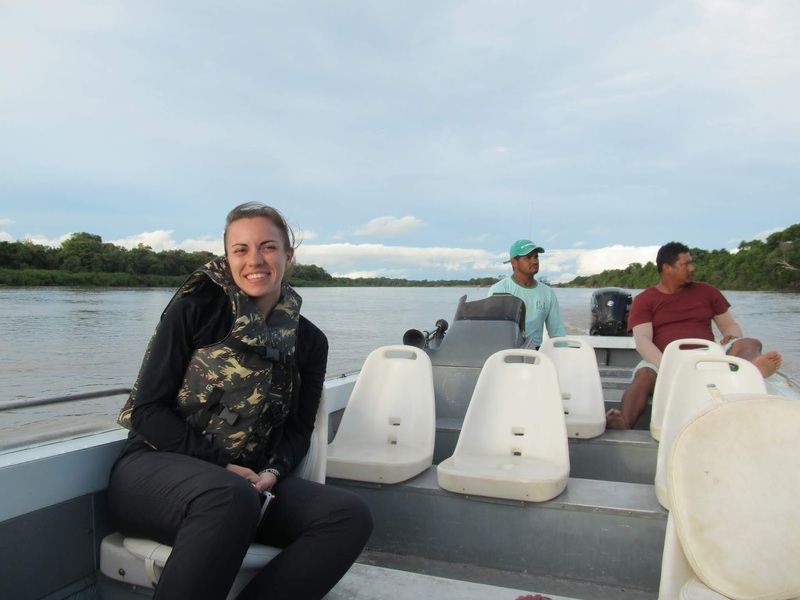 It is possible to visit the Pantanal independently, with a rented vehicle and making lodging and activity arrangements on your own but this was never a realistic option for us. 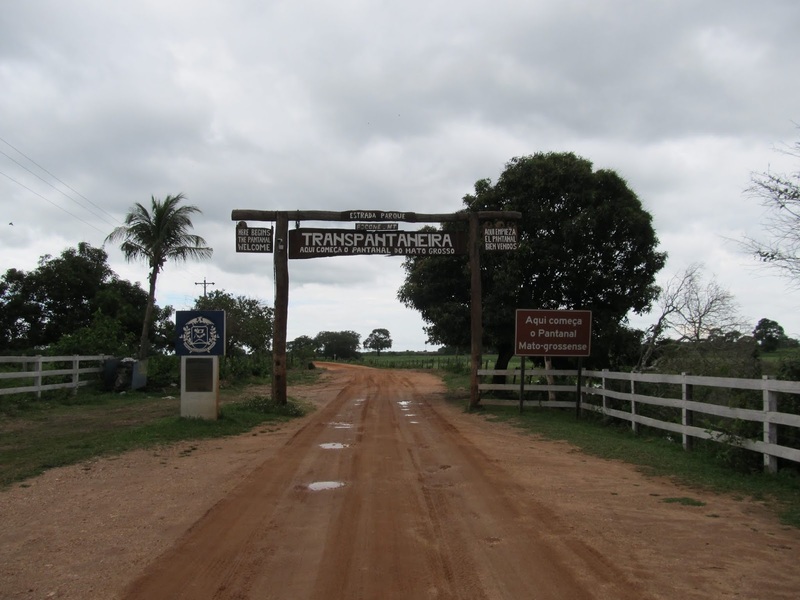 The Transpantaneira road also has a reputation for being a rough dirt road to navigate. More on that later. We were to learn later that there are more Brazilian visitors to the area than foreign ones but they come for the fishing and fortunately we accidentally timed ourselves to be there a week after the fishing season ended and in that beautiful shoulder season lull of not quite the rainy season, but well past the prime tourist time. We didn’t do it the cheapest way, but we definitely didn’t pay the aforementioned prices either. We eventually got a response from Joel at Ecoverde Tours and it was half the best offer of everyone else for the same trip. Scam? No, he’s been around longer than most and has a great reputation. So how? I don’t know. Probably because he’s a bit of a nut and doesn’t care about being that greedy. It was still a lot of money, we hemmed and hawed and eventually pulled the trigger and are glad we did. Joel’s email just said to show up at his guesthouse and something would get set up as the tours run constantly. So we did. His guesthouse (pousada in Portuguese) is the family home with a couple extra rooms. Super laid back, very friendly. He would chat and invite you out for drinks and buy or make you breakfast in the morning, gave us taxi money when we finally left and didn’t bother to charge us to stay both before and after the tour. That definitely sweetened the pot. His son also helped us set up our phone with a local sim card. 10 Reais for a sim card and 10 Reais/week for 1G of data. $3 a week? Um, yes. Once again reminded how disappointing telecom prices in Canada are…. Most tourists to the northern Pantanal these days fly into Cuiaba and start their pre-booked tour on arrival. Joel told us when we arrived that the following day he had a couple flying in and the tour would start the next day. We were halfway to the airport to pick them up the following morning when Joel told us that the other couple postponed and we’d be getting a private tour instead. Sweet! We met a driver who took us 100km to Pocone where the Transpantaneira road starts. After a quick stop to buy water and snacks (things get expensive in the middle of nowhere) we hit the dirt road. It is 140km to the end of the road at Porto Jofre from Pocone. This being a wetland, the road is elevated like a dike and there are well over 100 short one-lane bridges also. The bridges are mostly old and wooden, some looked ready to fall down, and some apparently had because there were crews working on a few and some detour roads going down and around others. Our first day we were driven only about 40km down the road to our first estancia. 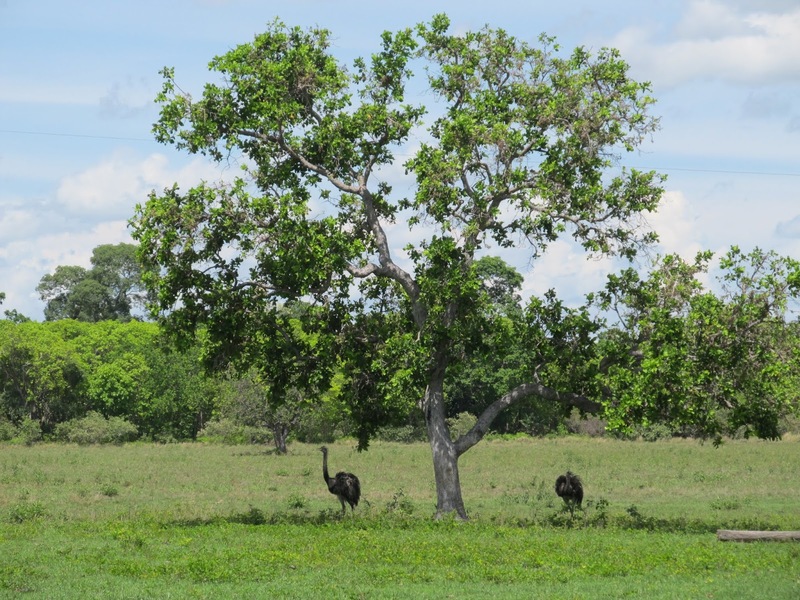 Despite being a major wildlife area, most of the Pantanal is privately owned and what development exists is primarily cattle ranches. The land is too wet and seasonally extreme for more advanced cultivation. 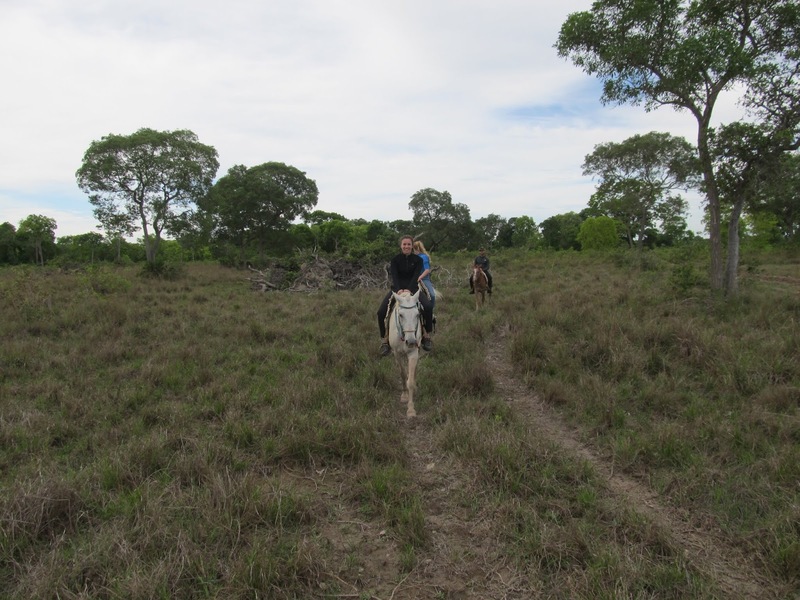 To supplement their income, many of the ranches are dabbling in the ecotourism market and provide the food, lodging and various activities for visitors. It’s a win for everyone and probably explains why prices are so high and quality varies so much. Our first ranch was a couple of km off the main road, surrounded by shrubby fields with dozens of cattle wandering around. 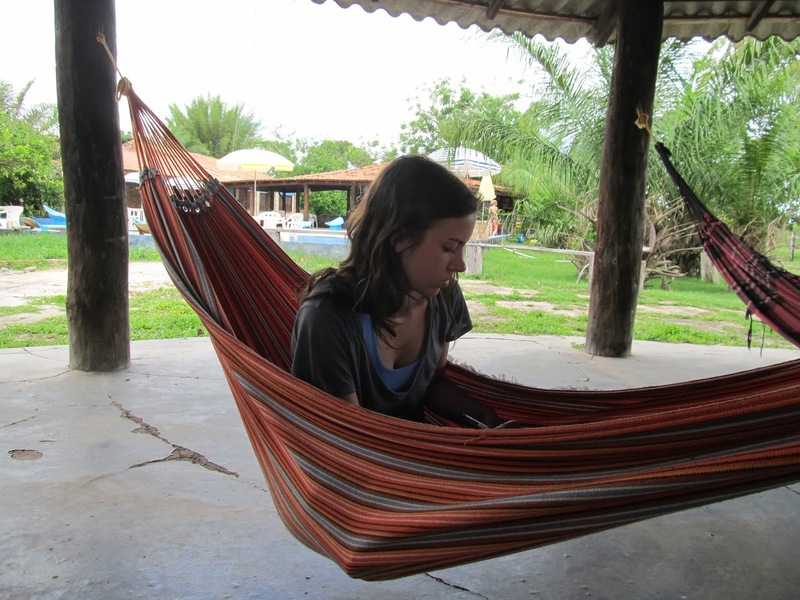 They had common eating, hammock, and games areas and a swimming pool. They had a few dozen rooms, but only 2 other guests, a young German pair that were on our tour in reverse. Business must not be that good or the effort not there because maintenance was lacking in many areas with many little broken things like knobs and windows and the ping pong table. We appreciated the tree frogs hanging out in our bathroom though. The next morning we went for a guided nature walk before breakfast. We saw a coatimundi and a river otter, but mostly fed the mosquitoes. Between breakfast and lunch we paddled along a small river to get a closer look at the birds and were lucky to see a few marmosets as well. 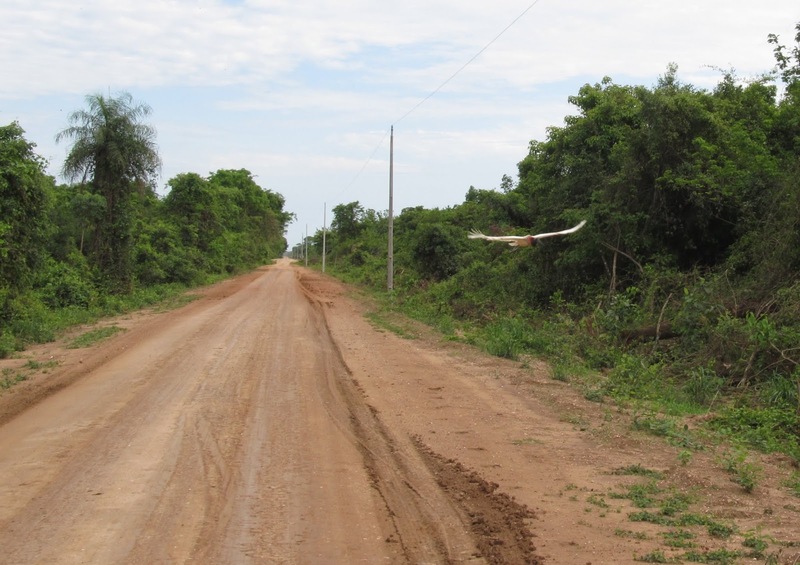 In this part of the Pantanal we were mostly seeing water birds including herons, ibis, kingfishers, hawks and the huge jabiru stork, the symbol of the Pantanal. The jabiru is the tallest flying bird in south america standing up to 5ft tall and has the 2nd largest wingspan on the continent after the Andean condor (which we hope to see later). Speaking of large birds there were tons of rhea running around as well. As cousins of the emu and ostrich they are the largest birds in the Americas. After lunch we split from the Germans and continued our private tour by open safari truck (benches on the back of a pickup) the rest of the way down the Transpantaneira to Porto Jofre. It took another 3 hours or so of bumping down the dirt road but the views were amazing. 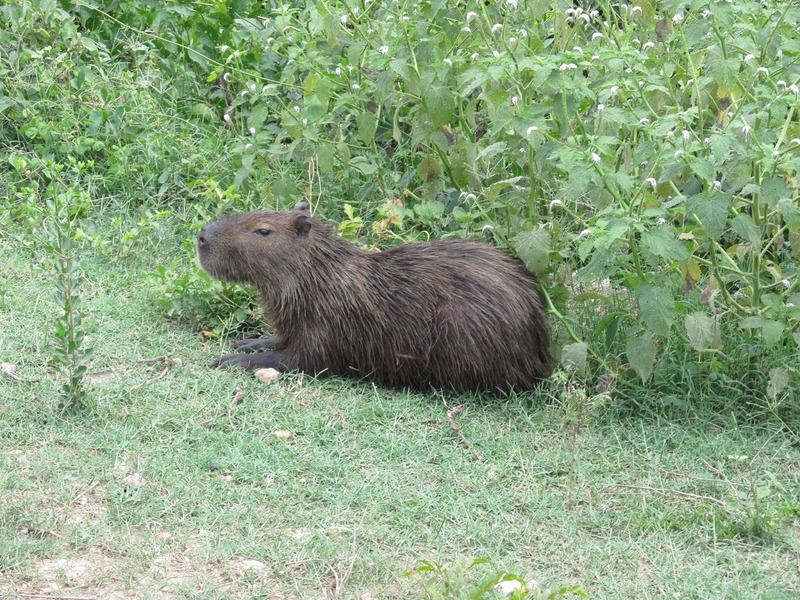 We enjoyed seeing all the different birds and nests along the way, lots of marsh deer and tons of capybaras, the largest rodent in the world. The road itself was much better than I expected, wide, flat and with little washboarding. As mentioned above there are lots of bridges but most were in pretty good shape. I don’t think it would have been all that hard to drive on your own if you were that type of person. Porto Jofre is a slightly more condensed cluster of simple lodges on the banks of a much larger river but there were only 3 others staying where we were so we could hardly call it crowded. Power is by generator so has limited hours. 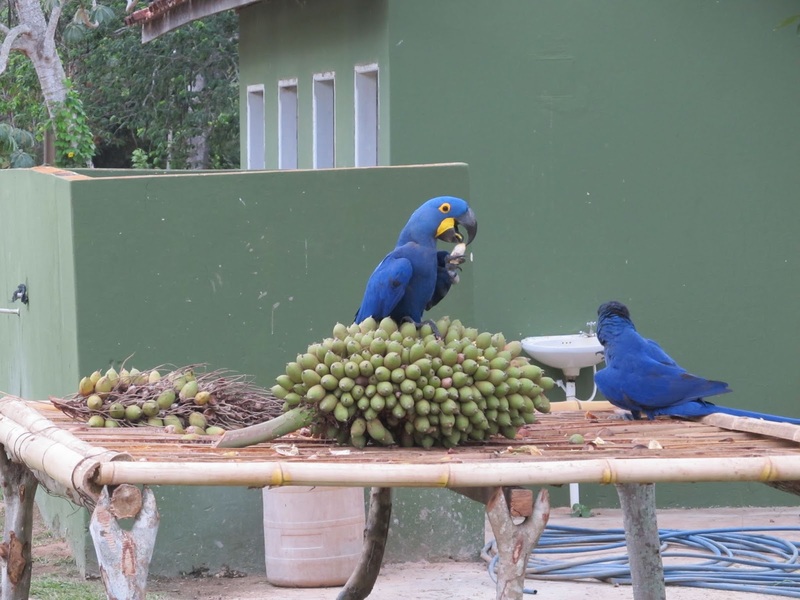 This deep in we started to get more exotic birds like the hyacinth macaw, toucans and parrots which could be found in the trees outside our room. 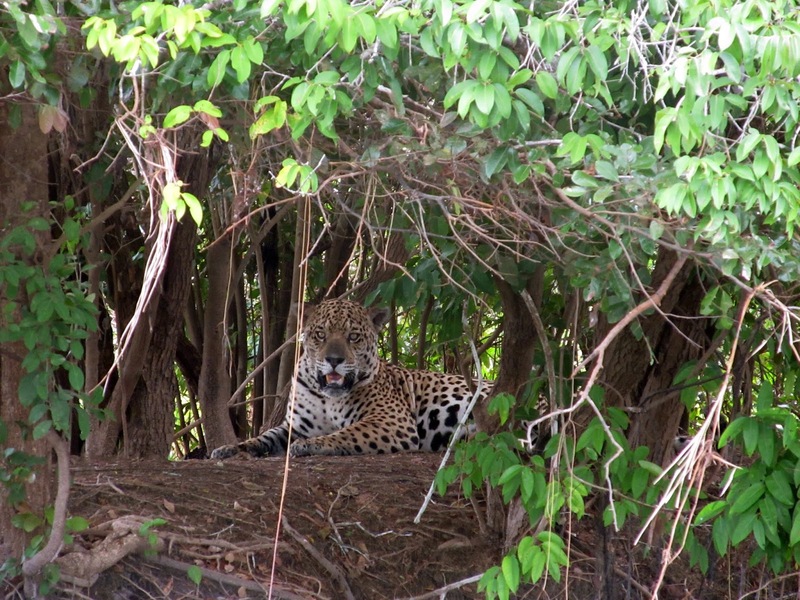 There are cheaper, non-Jaguar tours of the Pantanal and those from the south rarely see them. Having been, I now realize how foolish that would be to do. Unless you are crazy about birds, it is overpriced. 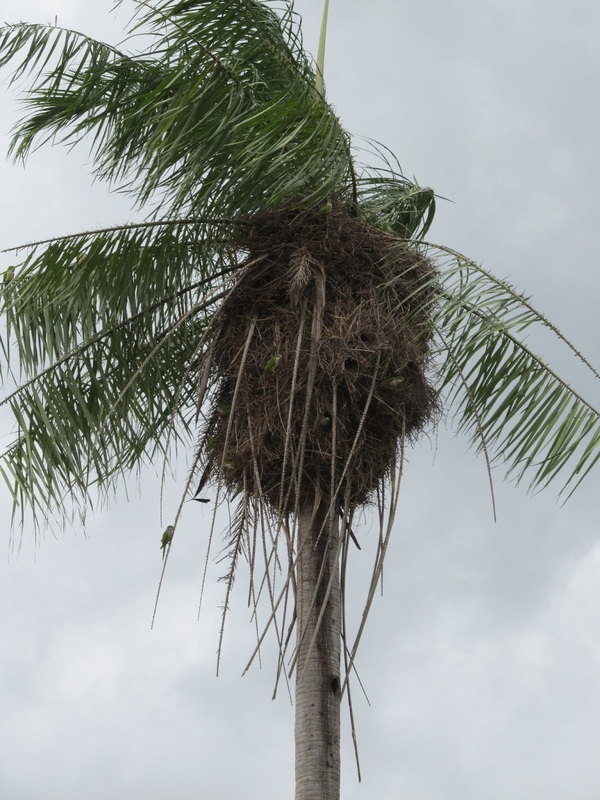 Lets face it, they say there are giant anteaters, anaconda and tapirs and all sorts of other cool animals living there but the odds of seeing them are slim to none on a regular tour. But for the jaguars, at the right time of year, it is incredible. Arrival in Porto Jofre, our truck on the right. A full day is invested in viewing the jaguar. 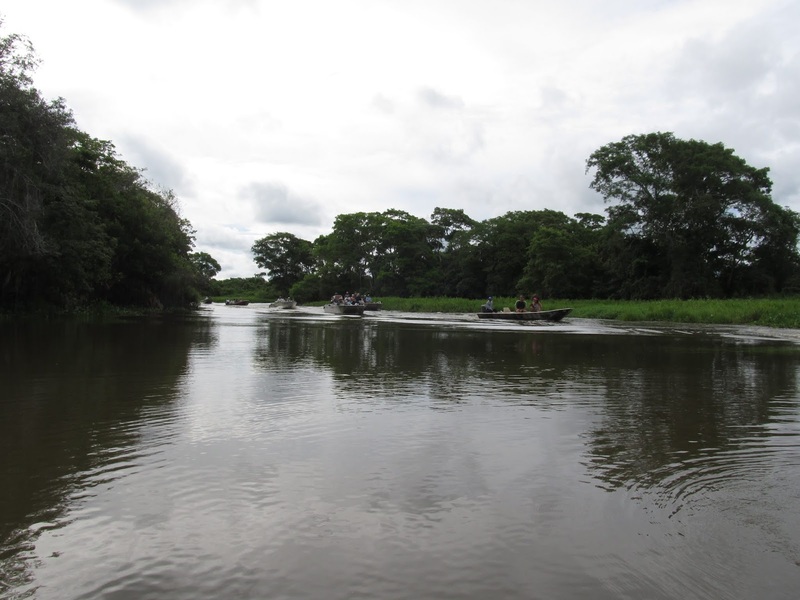 After breakfast you jump in a little motorboat and zoom up river and into the smaller tributaries to where the jaguars are known to live and hunt along the shore quite regularly. Like with whale watching or any number of other similar activities, as soon as a guide spots a jaguar, they send the word out and all the boats come running. Sounds like a bit of a mess but the numbers there are still quite small (we saw up to 12 boats at one time) and it is surprisingly organized and civilized with the boats respecting each other’s sight lines quite well. They try to keep a sensible distance from the jaguars too but with the narrow width of some of the channels we got surprisingly close, much closer than I expected. The animals are fearless and completely ignore you as they groom, hunt, swim, etc. The result is that the odds of seeing one are very good though you always hope to be one of the first boats on the scene and that the jaguar is going to be active. With a boat to ourselves and 5 hours in the morning and 3 in the afternoon split by a return for lunch, we were able to see 3 different jaguars on 5 different occasions. We were really disappointed to have to leave the next day because we wanted so much more. Even getting drenched in an hour or so of rain wasn’t enough to put us off wanting more. 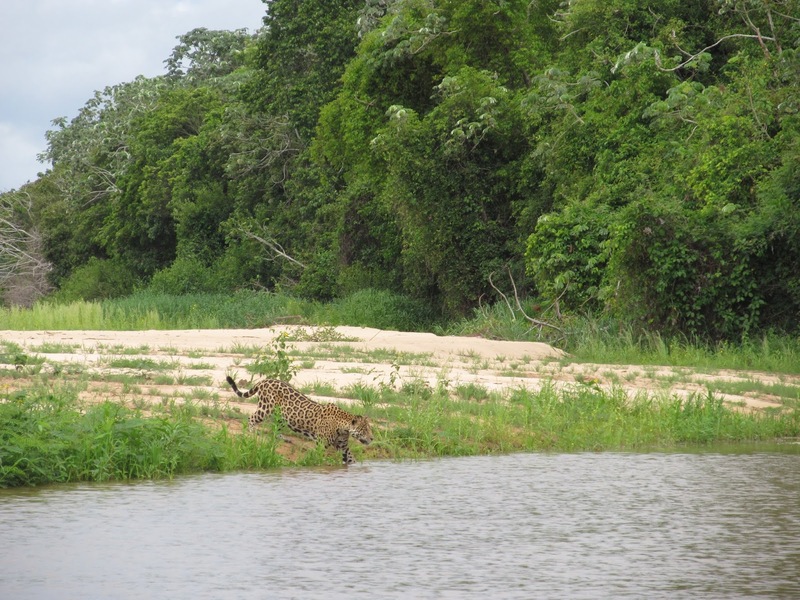 Of the 3 other visitors at our lodge, one was an American professor writing a book on jaguars while on sabbatical. He was there for a week. The other 2 were Belgian guys who had been there for a month to get as much footage as possible. We felt like imposters and totally out of place among the other boats. We must’ve been the only group without thousands of dollars worth of camera equipment and super zoom lenses trying to take that National Geographic shot. 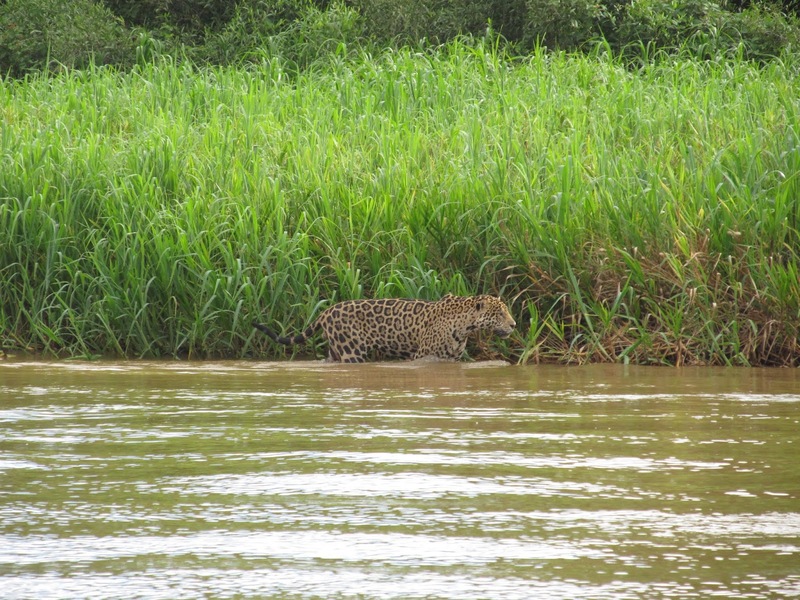 We also saw caimans everywhere, including as a jaguar lunch, numerous capybaras lazing about (which seems like a bad idea to me), some wild buffalo and the cutest trio of river otters playing in the shallows. Cruising around in the boat you could see the high water line several feet above and in places well over the banks of the “rivers” we were in. 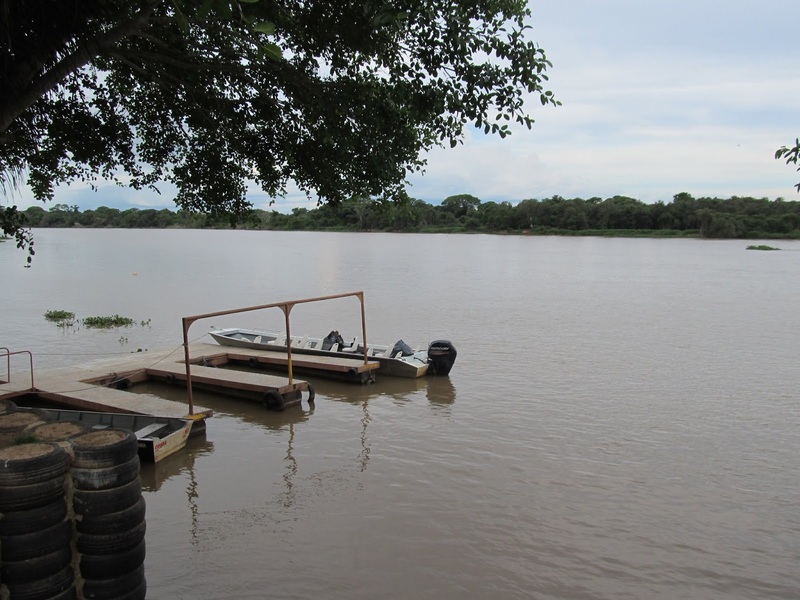 The land floods tremendously in the wet season and I can’t imagine enjoying or even being able to do many of the activities in constant rain, mud or floods. The mosquitoes weren’t too bad yet but…. just don’t. Most of the people there run away for the season too so we were happy to get in before it all but shut down. 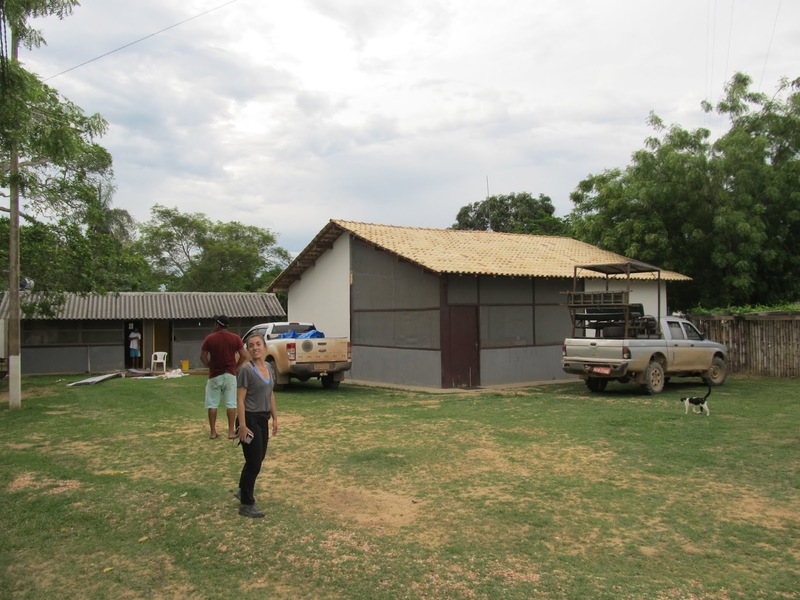 The last day was the long drive back to Cuiaba where we were met with a strong thunderstorm and flooding in the streets from the heavy rains. Amazing how quickly it can all dry off though. The temperature has been consistently in the low 30’s and not much cooler at night.